The availability in the recent decades of several molecular tools to assess cellular responses in high-throughput quantities did not change that Tissue Organ Bath Systems still are being considered a valuable tool for lead optimization and for the elucidation of the mechanism of action. ​An isolated organ bath assay is the classical pharmacological screening tool to assess concentration-response relationships in contractile tissue. Read more about the different types of Tissue Organ Bath Systems below. 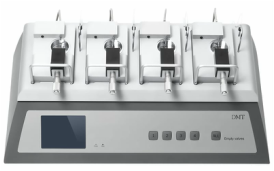 The 4-channel Tissue Bath System - 720MO is a highly sophisticated, robust, easy-to-use research instrument for the in vitro study of larger blood vessels (>500 μm) and other tubular tissues mounted as ring preparations of up to 10 mm in diameter, such as trachea or gut. An ideal student tissue organ bath system... The Tissue Organ Bath System - 751mT mini-TOBS is an affordable system that is recommended for a large variety of studies in the teaching environment, where contractile force measurement (isometric or isotonic) is required. Whether the experiment involves cardiac, skeletal or smooth muscle, the availability of a range of tissue holders and chambers make it a versatile laboratory tool. DMT has redesigned the Tissue Organ Bath System for the new millennium using the latest developments in material and computer and tissue engineering. The most common application of our Tissue Organ Bath is in cardiovascular research, using isolated aortic rings, heart tissue (papillary muscle, left ventricle) or other muscle strips.